Just prior to the 2011 USGA Women’s Open at the Broadmoor in Colorado Springs, an announcement was made that the USGA and the PGA had entered into a joint project known as “Tee it FORWARD.” There was a dual purpose to this project. First to help existing golfers have more fun and second to increase play on golf courses. Over the past couple of decades there had been a drop from 40 million to 20 million rounds of golf, or golfers participating, in this recreational sport. 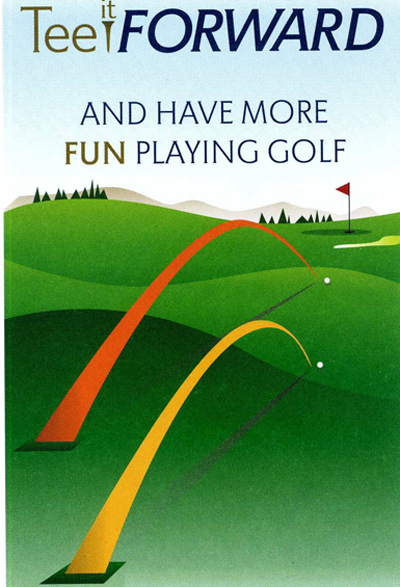 Following this project others were introduced including “While we’re Young” and “Get Golf Ready.” “While we’re Young” was to speed up play, which did not get the point across very well, and “Get Golf Ready” encouraged new golfers to learn how to play well enough to have the confidence to get out on golf courses to experience and enjoy the game. My first impression of “Tee it FORWARD” was simply to match a player’s ability to the length of a golf course. Too often younger golfers, and others who have greater expectations than their skill allows, tee off from the same tees professional or scratch (par) golfers play from. These tee boxes are known as the back tees or the tips. My guess is that this is simply an ego trip, which most frequently results in disappointment and no fun for not only the player but others who have to wait around for those idiots to find lost balls. Matching a person’s ability to course length is just part of the story. There are usually at least three tee boxes at golf courses and some even have as many as six. I have even seen family tee boxes half way down fairways to encourage even more play. To help understand what “Tee it FORWARD” is all about, the USGA and PGA explain that moving up a set of tees will result in hitting more lofted irons to greens, which will result in putting for more pars and birdies with better scores. This is all true. As a practicing senior golfer, as well as for any age golfer, “Tee it FORWARD” will mean that we can, in a way, compete with tour professionals. As was explained at a Golf Course Owner’s Association Convention by a PGA representative, “Tee it FORWARD” will often result in hitting greens in regulation. This being done, it becomes a putting contest between the golfer and the pros they see on TV. This will result in better scores and faster play. I encourage everyone reading this article to bookmark www.usga.org, www.pga.com and www.PlayGolfAmerica.com and occasionally spend some time visiting these websites to learn more about this wonderful game. You can even watch many tournaments live on your computer for a different perspective from what you see on the tube at the same time.